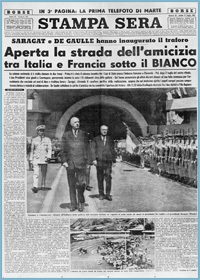 In 1953 the Ministers plenipotentiary of the Italian Republic and the French Republic sign in Paris the “Convention between Italy and France on the construction and management of a road tunnel through Mont Blanc”. This Convention is ratified and implemented in 1954. In compliance with article 8 of the Convention an Inter-ministerial Commission (CIG) is set up and given control of the management of the operation, its maintenance and its conservation. In 1957 the “Società Italiana per Azioni per il Traforo del Monte Bianco”, abbreviated as SITMB, is set up with the objective of engaging in the construction and subsequent management under concession of the transalpine communication tunnel between France and Italy. In 1958 by a Decree of the President of the Italian Republic the Concessionary Convention drawn up between ANAS and SITMB for the construction of the Italian section of the motorway tunnel through Mont Blanc, together with its operation for 70 years, is approved and implemented. Excavation work starts on the Italian side. On 19 July 1965 the tunnel is officially opened to traffic. In 1971 a new Convention is signed with ANAS, containing the regulations for conducting the management and maintenance of the Tunnel under concession—as far as Italian responsibility is concerned—until the expiry date of 2035. In 1999, following the well-known accident of 24 March, the Tunnel is closed to traffic. In the same year the majority shareholder in SITMB, the company “Autostrade S.p.A.”, is privatized. In the corporate structure of SITMB the Regione Autonoma Valle d’Aosta, ANAS, and the City and Canton of Geneva hold significant shares. In 2002, after three years of works dedicated to the restoration and modernization of its infrastructure, the tunnel is reopened to traffic; unitary management of the Tunnel by decision of the two Governments is entrusted to GEIE-TMB, a legal entity set up under EU law and consisting equally of the two national concessionary companies of the Tunnel, the Italian SITMB and the French ATMB. In 2006, at the initiative of the Italian and French Governments, a new “Convention between the Government of the French Republic and the Government of the Italian Republic relating to the Mont Blanc Road Tunnel” is signed in Lucca, novating and replacing that of 1953; the expiry date of the concessions is set to 2050. On 1st October 2008, after ratification by the Italian Parliament with Law 166 of 27.09.07 and by the French Parliament with Law 2008-575 of 19.06.08, the new international Convention between Italy and France comes fully into effect.